Wellington is a windy place, we’ll accept that. Except this year, when it has been unusually calm, but we’re not complaining! And New Zealand is a green, clean, and (almost) energy sustainable country. For years we have got by on nothing but hydro-electric and geo-thermal power – we’re the envy of the world, in many ways. Lately however we’ve ben profligate in our energy use, and have been burning coal, oil, and gas. The mighty Maui oil and gas field has been depleted in an amazingly short 15 years or so – if we had used it carefully we could have had gas for cooking for the next 100 years or more – instead we piped it to shore, and burnt it off in a generator to make steam to drive a turbine to create electricity – a roundabout way that uses up the majority of the energy before it even gets to your home. Now we’re doing the same with the also large Tui oil field, and we’re not even keeping the gas – we’re flaring that off at a tremendous rate. NZ is now nothing but a profligate energy waster – the only reason we’re still green is that we have such a low population. So, time to do something about it then! Mill Creek wind farm is the proposal to build a new wind farm in the Ohariu Valley north west of Wellington, and it borders the other major wind farm project: West Wind, also by Meridian Energy. A self-appointed group of selfish Makara Residents, the “Makara Guardians” led by local Makara resident Jenny Jorgenson tried their hardest to get the West Wind stopped – thankfully they were tossed out in the Environment court. A similar group is also fighting the proposed Mill Creek giant wind turbines, and they’re just as selfish too. Why should the small, self-centred property interests of the tiny handful of local residents have any rights over the needs of a nearby city of 200,000 or a country of 4 million, or even the greater needs of the world in an energy crisis? The wind turbines are huge, yes, but very very quiet. I’ve visited the wind farms near Palmerston North, and driving between the turbines in a gale, there was no sound. Only when actually standing directly under the turbine could the swishing noise be heard, and yet there they were, megawatts each, powering hundreds of homes with each turn of the blades. The locals in Woodville feared it at first, and now they love it. Overseas, some protest has centred on the the possibility of the giant blades killing flying migrating birds. Well, even better for us: our endangered birds are flightless, so no chance of harm there! It’s the most ecological way we can make energy, stops us wasting our gas and oil fields, and is calling for submissions that close on Monday 16 June. Write in online and support this project now. Yeah! Selfish Makara residents. They should be happy to take one for the rest of us. Seriously though, I’d be happy to have one of these things in my back yard, never mind up on the ridge a few kms away. A number of inaccuracies in your entry Maximus, New Zealand has never “got by” through only using Hydroelectric and Geothermal electricity production. A little research and you would have found a multitude of fossil fuel burning generators that have been in use since NZ first had electricity – not least New Plymouth, Whirinaki, and the old Rongotai plant. I have no doubt that wind turbines are a great source of renewable energy, but they come with a number of downsides that people quickly forget. Firstly, they only operate when the wind is blowing. Overseas this problem is mitigated by having large interconnected electricity networks which allow energy to be brought in from other areas/states/countries. Germany and Denmark are fine examples where there are high proportions of wind generation. What happens when the wind isn’t blowing there? Their energy is supplied by the French and their nuclear generation, or the Polish and their coal. If New Zealand wants to have their lights on when it’s calm, then we’ll require more reserve generation than what is already required. Secondly, and most importantly to me, there is a value in leaving landscapes unspoilt by humans. I personal abhor the thought of a rugged Wellington landscape covered with a field of wind turbines. Am I alone there? Just because it is out of my sight, doesn’t make it out of everyone sight. 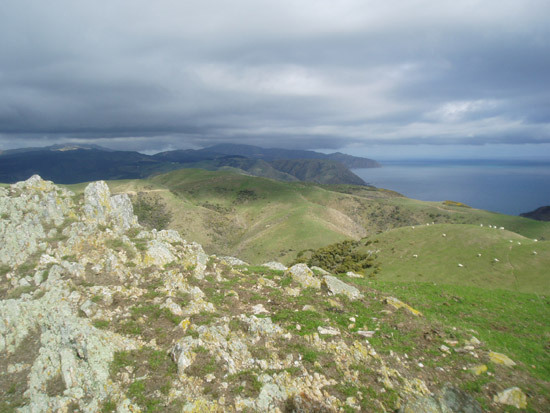 I don’t think that the Makara Guardians are selfish for keeping their landscape preserved – call me a NIMBY, but I don’t want a wind turbine in my backyard! Kiwi – NZ has one of the highest levels of renewable energy in the world – i don’t have the figures, but i think we were 2nd only behind Iceland? Whatever: we had a better record than we have now. And wind power helps us reclaim that record. Lets face it – the wind blows here a whole lot more than Germany or Denmark, plus we have giant hydro lakes than can (and do) get switched on and off at the flick of a switch – or more accurately, in this computer controlled age, a tweak of a mouse button and Lake Tekapo goes from whoa to go. New Zealand wind farms have (again, from memory, so approx only), about 45% efficiency – which is FAR higher than anywhere else in the world. We live in the Roaring Forties – Wellington and Pahiatua are perfectly sited for picking up the predominant westerly hitting us from the Tasman. A shift to wind power will allow us to conserve the water in the hydro lakes to a far greater degree. We don’t have the option (and nor would i want it) of switching on nuclear power from France. New Zealand needs to get real and become self-sufficient in power, at all times. And re your final point – no, presumably you are not a NIMBY, because Makara is presumably not your back yard. It is only the back yard to 200 residents of Makara, spread out over several square kilometres. They’re the NIMBYs in the situation. Makara is not a beautiful landscape in the way that Central Otago is – and most of Makara is not visible, so I see no issues with having these tall silent sentinels on a landscape that most cannot see. Personally, I would like to see them from the central city, but having them a few miles away, not hurting wildlife or farm life, is a great solution for Wellington. I think we might be second only to Iceland re: the amount of water we have? My dad has been strongly involved with an anti-turbine-group in Raglan. One of the main arguments is that for Raglan, a small town whose economy is reliant on eco tourism, the presence of a wind-turbine plant could quite reasonably turn tourists off coming to Raglan, affecting the livelihood of the town. There is potential for wind turbines to be a tourist attraction (like they are in Ashhurst, but, uh, why would you otherwise go there? ), but there’s also potential for these 40-storey concrete constructions to scare off people. A planned wind-turbine farm in Scotland was canned due to the adverse affect it would have had on tourism. Wind turbines are a good source of energy, but every opposition to one shouldn’t be shouted down as NIMBYism. llew: Would you want this wind turbine in your backyard? Raglan = “tourists” = surfers = eco-warriors = love of windmills and kombi vans (and stick-wax). If this was a sewerage plant being planned for Raglan, i would fully expect the Raglanites to be spewing at the proposal. But it will help keep NZ eco-friendly. I reckon surfers will love it! I’d rather have three-blade turbines in my back yard than a Three Gorges or a Three Mile Island any day. Robyn – nice link: emotive stuff. So i have to ask: would you rather have this in your back yard? I went to Makara once, and it seemed to be deserted, and just scrub and gorse – typical back blocks unloved stuff. Can’t believe anyone gives a toss about it – certainly doesn’t look like it. But it is fantastic that it is so close to Wellington, and so mountainbikers can get there and thrash about. But wouldn’t want to live there. We had a presentation from the CEO of Genesis at work recently and he touched on many random energy issues, a lot of which are relevant to this discussion. The big one is the effect of wind power. Every wind turbine that added to the system needs a backup generator of some sort. He specified about 35% utilisation for wind turbines. (Maximus: is this the 45% efficiency that you were referring to?) It’s great when it’s blowing, but people don’t stop cooking on a calm day. The net result is a win – we use less thermal than otherwise – but we’re never going to decommission coal and gas generation through building wind farms. The second issue is water reserves. The media has been all over this one already. When we factor in the research toward tidal, things look a bit better; the moon isn’t going to stop pulling at the water. However, maintenance is high and costly for those generators. Getting the renewables percentage up is going to be difficult. Energy demands are still increasing, especially at peak times. The amount of power that we can generate from hydro, as it is, is limited. With the variability of wind and solar, we don’t have a lot of option for back-up power supplies. It would be great if we could store energy efficiently and en masse, to smooth the differences between peak and non-peak times, or shift people’s habits to the same effect. Neither are going to happen in the short term, so we’re a bit stuck. NIMBYism doesn’t foster a lot of respect with me. It strikes me as placing form over function and appearance over reality; it’s only real if you can see it. Not in the world I live in, bud. If we suffer outages at the hands of NIMBYs, maybe we should have their power cut first. Less cynically, has Meridian approached them with an incentive? Rebates for use of their view may help. Greg: either a rebate, or some sort of minority stakeholding so they can see it as a licence to print money. Still, some people are gullible enough to think the Great Leap Backwards is a manifesto. Dude – spoke too soon about the lack of wind! Ever since you posted this article its been howling like a gale. Just be quiet and it’ll all blow over…. When we tried going out there for a ride a few months back the meridian guards wouldn’t let us near the place, what’s the story, is it open now? Anyone know if its going to be open once complete? That’s by big gripe, maybe if the land was public and I could use it I could see why someone would be concerned about these turbines, but the whole area seems to be blocked off and unused. Wind generation is good (when its in the deep south in absolutely sparsly populated areas) but I’m an Ohariu Valley resident and these turbines are only stage one. Now Maximus I know who you are and you can’t tell me that the Mill Creek turbines approved thus far are the only ones going to built. IT IS MERELY stage one (ask your dad) of many more stages and building to come! Might I add these bloody turbines are powering Auckland residents. Woo Hoo can’t wait until we have Porirua residents heading through the Ohariu Valley ‘SUPER-HIGHWAY’ – no disrespect intended but a lot of those little shts are going to be keen to burglarise YOUR house too, especially when I point them in its direction! RT, you know who i am? I very much doubt that. And i have no idea who you are. My dad is long gone. But despite your concerns about the residents from Porirua coming through to burgle your house (please: not burglarize – that’s such a crass and ungrammatical americanism), they can do so now, i’m sure. But perhaps they don’t ? Lemmings are alive and well.